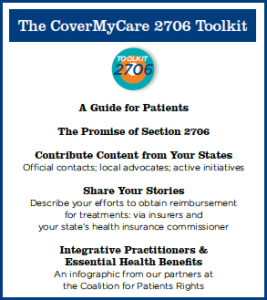 Our 2706 Toolkit provides information and tools for anyone interested in advancing the purpose of Section 2706: educating officials in your states, insurance company management, the local media, and joining or forming groups of consumers, patients and providers who insist that full access to affordable licensed providers is important to health care choices now and for the future. Click the image of the cover on the right for the complete 9-page PDF, or select single sections by clicking on the banners below. CoverMyCare encourages you to contribute to our state-based information resource: share your stories of integrative care and the denials of claims that is most often the patient experience. Head over to our crowdsourcing page and help paint the national portrait of the public experience with integrative care. Our States Page can use new and updated information on the people and offices responsible for insurance regulation in your state. If you are part of a group working together to advance compliance with Section 2706 please share that information as well. We will be most happy to give all the shout outs we have at our Facebook and Twitter pages! Use these Word documents to modify and address to the officials responsible for insurance regulation and services to you and your fellow state residents. Click on each document to download it. The Affordable Care Act defines basic essential health benefits that must be included in any insurance plan sold through the ACA insurance exchanges. This infographic (PDF) from our partners at the Coalition on Patient Rights shows the types of conditions whose treatments must be covered under the ACA, and the licensed integrative healthcare providers a patient might choose.